This is the second edition of the definitive analysis of the international wine trade. This new edition focuses on individual trade flows across the major importing and exporting countries, examines the increasing role of food retailers in wine selling and looks for the future trends which will shape the industry in the new millennium. 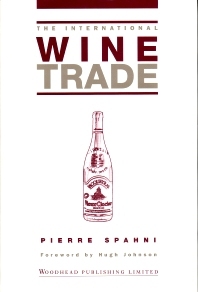 The book begins by examining technical factors in the wine trade giving rise to differences in pricing and considers how wines' characteristics help to position the final products. It shows how trends in consumption are changing in different ways in the traditional and Anglo-Saxon markets and explains the effects of developments in international trade such as the role of trade barriers. This edition will be essential reading for all wine trade professionals including: wine producers, importers and exporters, negocients, co-operatives and regional economic development agencies, and wine merchants and retailers. Production; Consumption; Prices and other trade determinants; The major import markets; Exporter’s profiles; Transition economies; Brave new round; Appendix: Tariff schedules for key markets.